No matter the financial portfolio of a family, teaching children the benefits of saving money establishes a solid foundation for smart decisions later in life. The most common reply parents make to their child/children is a good place to start. As a child grows and becomes aware that money is needed for food, shelter, and other things in life, they also need to realize it has to be earned. This can start around the home where they can do chores, babysit for the neighbors, or mow lawns. Then as a parent, helping your child/children to appreciate the value of that hard earned money is the next step. Have three envelops with the words, HOME, SAVINGS, and SPENDING MONEY laid out on the table. Your child should divide their earning into thirds and place a third in each envelop. By doing this you’re visually and interactively teaching your child that as they grow up, money isn’t funneled into one avenue of living. It has to be divided and used in all aspects of life. As the parent you can decide whether or not to use the money labeled HOME. You can incorporate it into the families budget, or set it aside without your child knowing for college or expenses when the need presents itself. The envelop labeled SPENDING MONEY is to go back to the child, and can be used for whatever he/she wants. Along with the SAVINGS envelope, this teaches them from a very young age how to use money and how to save it. When they become teenagers, hopefully they’ll have some money sense. Still this is the undeveloped stage in their life, so help guide them through these uncharted waters by suggesting ways to live frugally. Free is good – Have them look through the activities section in the local newspaper and do things that don’t require money. Free concerts, free movie screenings, or free social gatherings are great. Hold on to that loose change – Every time money is spent, encourage your teenager to drop the change into a bank or drawer and save it. After a little while they’ll have a nice little nest egg to add to their savings. Learn to competitive shop – Teach them not to be so quick to purchase an item. They can shop around and look for the best deal. If they can find a buy one get one free option, even better. Have them set a price point and not go over it. On-line – There are so many on-line survey companies that target teenagers for their point of views. Often times these companies give the option of a cash pay out or a prize. Of course check them out as to their legitimacy first. 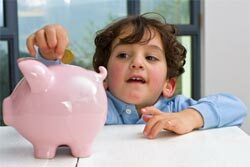 By teaching your children from a young age about saving money, hopefully a frugal adult will emerge. If there were money trees we’d all have them, but since there isn’t one, teaching children money strategies gives them a head start in doing well in life.